Today for #pathways2resilience we are featuring Vicky, one of the Centre’s deputies. Vicky was diagnosed with secondary breast cancer in June 2015, she has two young children, and she is learning to live with the psychological impact this diagnosis brings. In her feature she talks about the Centre and about her recent venture into the world of politics! I was diagnosed with secondary breast cancer in June 2015 at the age of 40, nine years on from my primary diagnosis. Through the haze caused by the crushing anguish of this diagnosis I found myself venturing back to online breast cancer support groups. 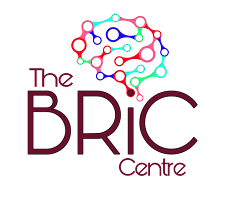 Around October last year I stumbled across and joined the fledgling psycho-educational group ‘Building Resilience in Breast Cancer’, the private member group of The Research Centre for Building Psychological Resilience in Breast Cancer, headed up by Professor Naz Derakhshan. By the end of the year I had been recruited by Naz and deputy Tamsin to assist with running the group. 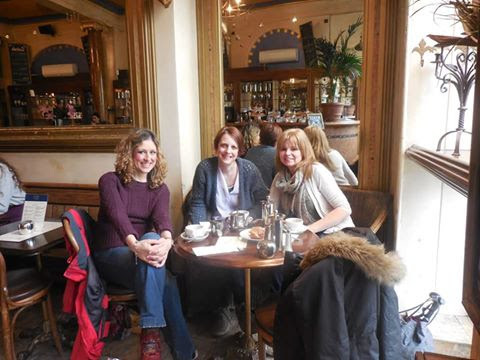 We have seen our private support group expand and flourish, we have established our public page and after working together so closely, the three of us are now firm friends for life. Earlier this year Tamsin and I developed and launched the Centre’s blog, Panning for Gold. The aim of the blog is to provide an inclusive space which represents the many voices of women with a breast cancer diagnosis. I braved writing a couple of blog posts myself around the subject of secondary breast cancer, one of which I wrote a year on from my diagnosis. In addition to helping out at the Centre, I have recently found myself volunteering with Breast Cancer Care at two events to promote their ‘Secondary. Not Second Rate’ campaign. 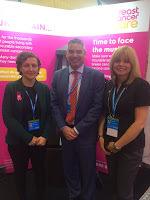 I attended the Conservative Party Conference in Birmingham, then the following week joined them again at an event at The Houses of Parliament. Being involved in this type of event really highlights the lack of knowledge out there over the difference between primary and secondary breast cancer and because of this secondary breast cancer does not get the coverage and funding it deserves. People don't die from breast cancer in the breast and local area (Stages I/II/III) however 30% of people diagnosed with primary disease go on to develop secondary breast cancer (Stage IV), where it spreads to distant areas of the body. Around one person every 44 minutes dies from SBC in the UK. It has NO cure and many people don’t know this fact. With access to the best available care and treatment it can in some cases be managed and controlled for some time but still secondary diagnosis sees only 15% surviving 5 years and 10% surviving 10 years. Upon speaking with Jeremy Hunt, Secretary of State for Health at the Conservative Party Conference, the message we heard from him was that early detection of primary breast cancer is the key to dealing with the disease and while I agreed that this can make all the difference with the outcome for many, I politely voiced that despite my breast cancer being detected very early, my cancer still spread and now I’m living with secondary, incurable breast cancer. 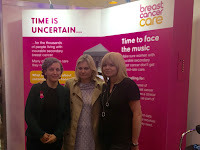 At the party conference in addition to Mr Hunt we met and spoke with cabinet ministers Justine Greening and Damian Green, along with staunch Breast Cancer Care supporter Craig Tracey MP and many other MPs, all of whom were receptive of the discussion, some learned something from us and some were stunned by what they heard. 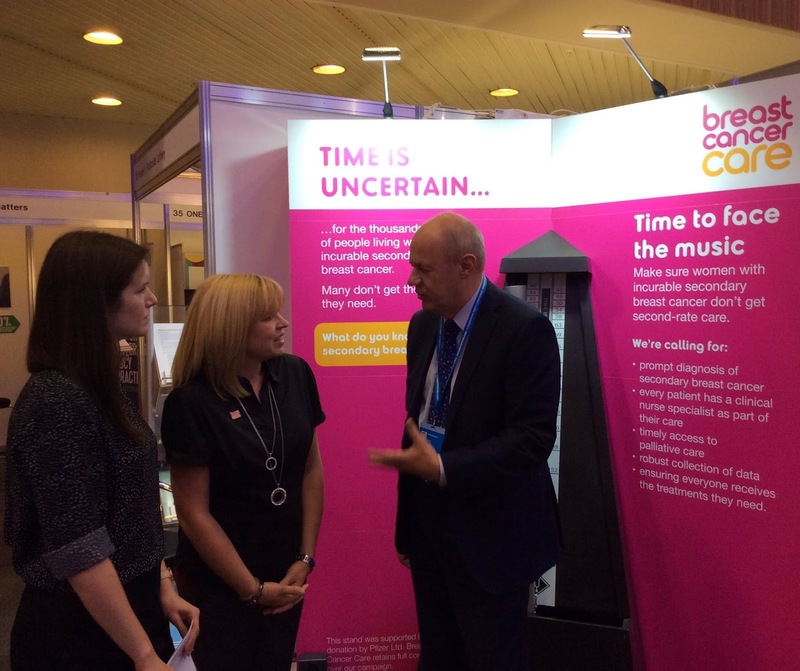 Following on from this, ahead of secondary breast cancer awareness day, I attended the Houses of Parliament with Breast Cancer Care to continue with the campaign and meet with MPs who had agreed to drop in to the event, which was opportunely directly before PMQs. 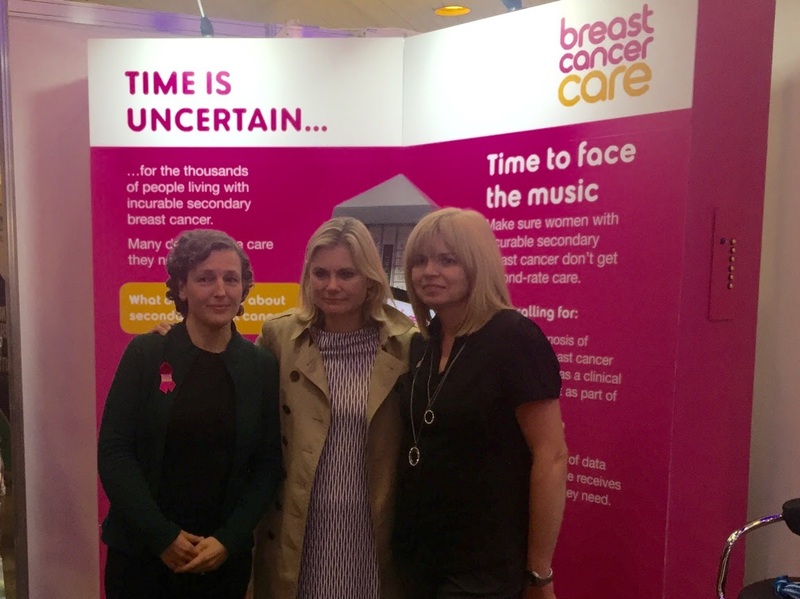 The MPs were again receptive and came to understand the difficulties we face living with secondary breast cancer. The ‘Secondary. 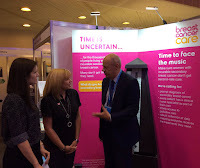 Not Second Rate’ campaign has a few key points and the main focus at the events was on secondary breast cancer data collection by Hospital Trusts. Breast Cancer Care has discovered that even though it has been mandatory for 3 years, only one third of trusts are recording when people are diagnosed with secondary breast cancer. This means there is no accurate figure of the number of people diagnosed or living with secondary breast cancer, and makes it impossible to plan services. This crucial information would highlight how effective primary breast cancer treatments are and it would ensure the more efficient delivery of services and treatments to secondary breast cancer patients. Following the Houses of Parliament event, Jo Churchill MP, raised a question at PMQs about secondary breast cancer data collection. Unfortunately the Prime Minister wasn't prepared for the question and doesn't appear to recognise the difference between primary and secondary cancer. 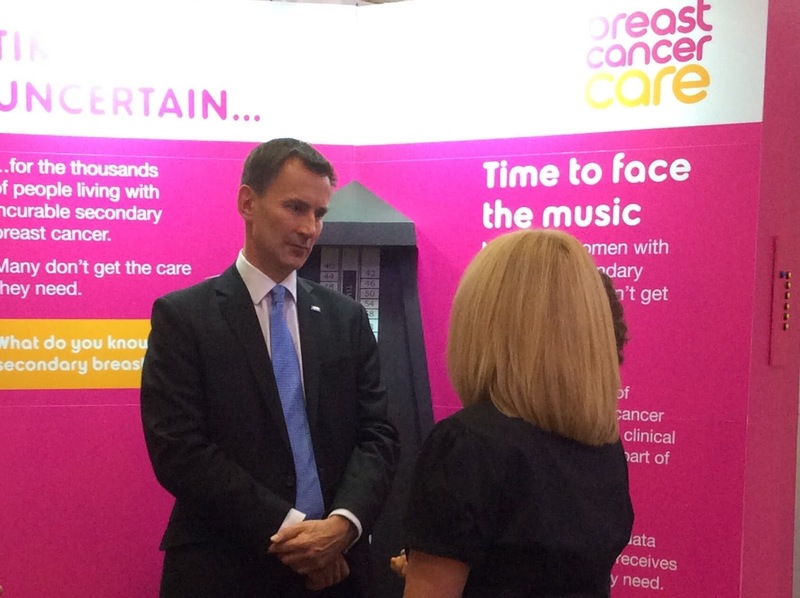 It was however great to see the subject raised, so Breast Cancer Care will be working hard to keep up the momentum. I am proud to have played a part in this and just hope we can make a difference. Here’s hoping for a future living better and for longer with secondary breast cancer.